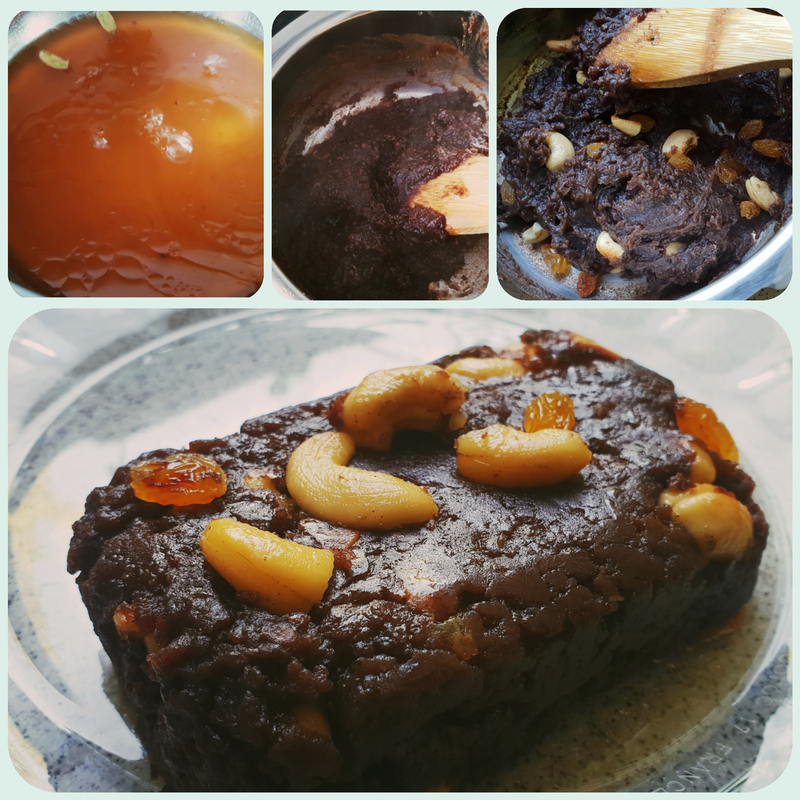 In a pan pour 2 tbsp ghee, cashew nut, ragi flour and make a roux. Roast the flour in low heat till the cashew nut turns brown evenly. In a 2 ltr Pressure Cooker, add water, jaggery, cardamom powder and the remaining 1 tsp of ghee. Cook for a whistle. Remove pressure carefully and transfer the roux to the boiling water. Give a quick mix. Close the lid with weight on and let it remain for 15 minutes. 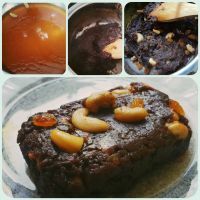 Open and serve the yummy halwa. Ragi halwa tasted awesome.kid asking for one more one more……thanks for the recipe. Glad to know that your kid loves this healthy sweet. I suggest give him one or two pieces daily! It has iron, calcium, manganese, fibre, good fat and healthy version of sugar! Instead of giving white sugar and refined oil loaded sweets, this sweet is very healthy! Glad that young moms like you are exploring healthy grains. Thanks so much for sharing your experience. I tried this recipe yesterday. I have a doubt in the roux process. I added ghee, Ragi flour and one cashew and roasted for about a good 25 minutes in low flame but the cashew did not even turn brown for me. It was just the same colour as it usually is. Anyways I went ahead with the recipe. It tasted awesome and the consistency was great but I felt a slight bitterness. Could it be my Ragi flour got over roasted? How long does it usually take for the roux? It takes maximum of 10 minutes to get roasted. As you have mentioned, it got over roasted and hence the bitterness. Please go by the smell if the cashew tip doesn’t work for you. When the flour is roasted well, you’ll get a nice aroma. Hope this helps. Please try and share your experience. Thanks once again. What is the quantity of boiling water in step 4? I’ve given the measurements of everything in the ‘ingredients’ section. Please go through once again. Thanks so much for your visit. I am a bit confused regarding water quantity in step 3 & 4. In step 3, you have advised adding water and then in step 4, there is a mention of boiling water. The steps are clear. When you add water in the cooker and cook for a whistle, it’ll reach the boiling point. We have to manually release the pressure after switching off. You’ll find the water in the boiling point. Now add the roux and mix. Simple. Btw, if you are new to opos, i suggest you join the opos support group on Facebook before attempting this recipe. There are structured lessons to be followed. Dear Ma’am, I tried Ragi Halwa today and tried to cut them in to Burfi shapes. Relished easy, quick, Healthy, soft yummy Burfis with jaggery. Finished off quickly too!! Definitely a keeper recipe. Thank you ma’am for posting a healthy recipe. Glad to receive a validation from you. 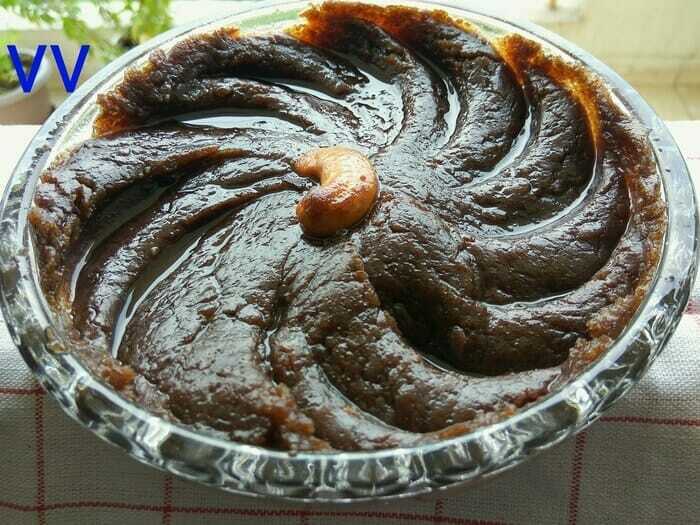 Your halwa looks so delicious! Thanks so much for sharing your experience. At the end the 5th step, do we need to cook in high flame or medium for 15mins? No need to cook. After one whistle switch off the heat, open and mix the flour. Keep covered for 15 minutes. The flour gets cooked in the retained heat. 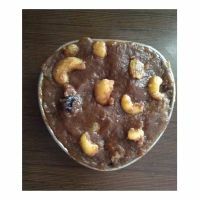 Happy to see the yummy healthy halwa! Thanks so much for validating the recipe. You can try ragi momos posted in the website. For the filling part, you can follow pressure baking technique. 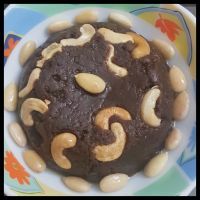 Hi vv…tried ragi halwa… came out well n loved by kids..thankyou For the receipe. .. Thanks so much for trying this recipe and sharing your experience. 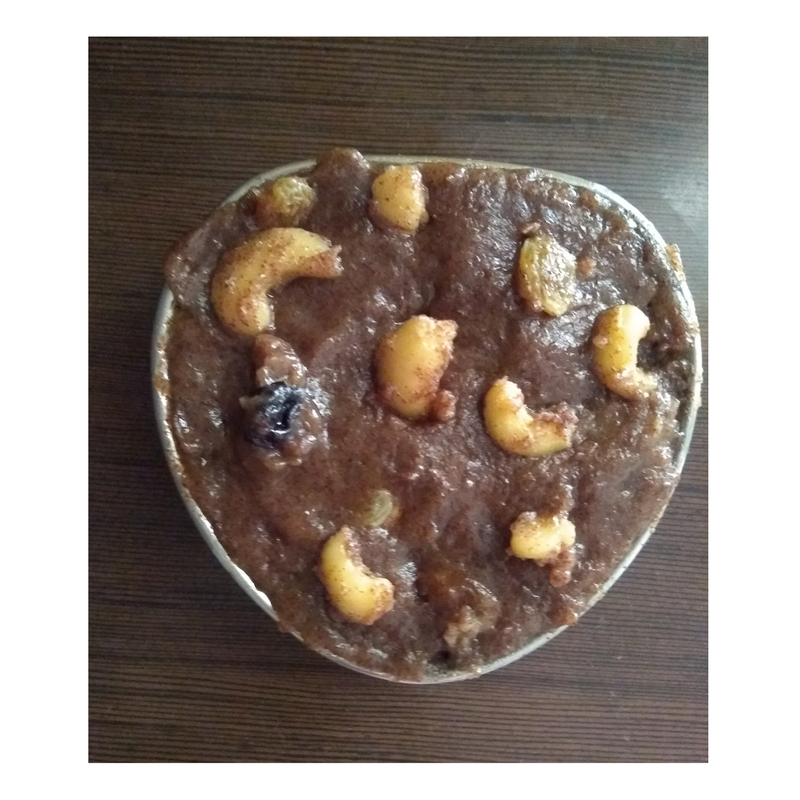 Glad to know that your kids enjoyed the simple healthy halwa! This is definitely a keeper considering the minimal items required, less preparation time and high nutritious values it contains. 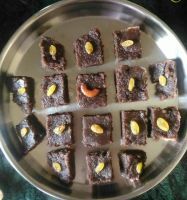 Easy way to make kids eat Ragi disguised as Chocolate brownie (attaching pictures of my prep). 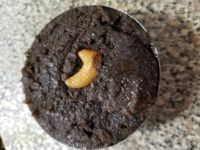 My son relished it thoroughly thinking it’s a brownie and while I actually revealed midway it is Ragi he still ate it without whining. Thanks a lot for such a simple yet delicious and a healthy recipe. Thanks so much for trying this recipe and a detailed comment. Glad to see people making healthy sweets for their kids. Thanks so much for sharing your experience. I tried this halwa today for Naivedyam. It was mind blowing and yummy in minutes with perfect sweetness and less ghee.Thank you so much VV. Im extremely happy to receive a validation for this recipe from you!! As you said this is such a yummy healthy recipe gets ready in minutes! 4. Remove pressure carefully and transfer the roux to the boiling water. Give a quick mix. We have already used water while in Pressure cooker. Do we add extra water. If yes What quantity. When you open the cooker after a whistle, it’ll be in a boiling state. At this stage, you have to mix the flour. Can we use kambu (bajra) flour for the same recipe? Yes, you can use kambu flour. Thanks for your visit. Awesome taste and easy to prerpare. Thank you so much so this healthy tasty recipe. Need to tick off many from this valuable site of yours. Happy to know that your daughter liked the halwa! Children always give their honest opinion!Thanks for trying and validating the recipe. Yours looks like choco cake! Awesome!! 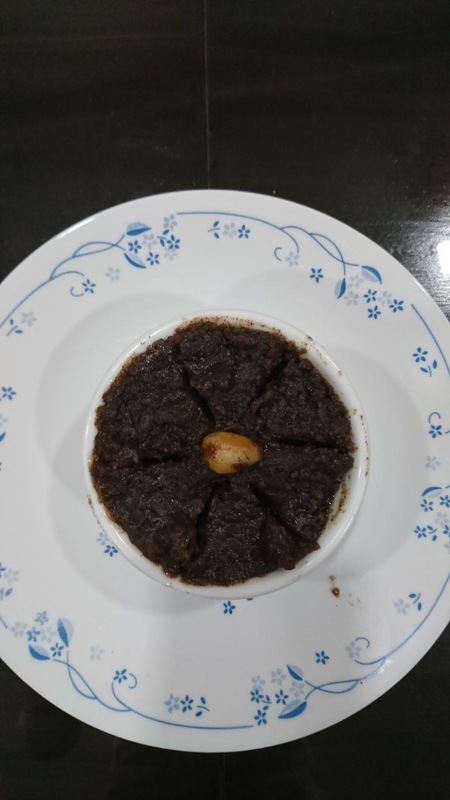 excellent ragi halwa…superb taste..my dsughter finished a bowl full of it. trying each and every recipe.. Thanks so much for trying and happy with the kid’s validation!! You are my strength and really happy that it was loved by your daughter! !